I am not ready or willing to leave the excitement, the richness of resources and the very comfortable community that I’ve grown accustomed to here. Today I went to an open brown bag lunch discussion at the Kennedy School with Kishore Mahbubani, currently the Dean of the Lee Kuan Yew School of Public Policy at NUS (and for over a decade previously the Singapore ambassador to the UN). The three of us seniors (Shi Ming, Xin Wei and myself) all arrived late from different places and settled for various nooks at the back of the room. Another random but cool opportunity – on Monday the Food Network was filming a tangentially Harvard-related episode so whoever wanted to go to the filming could enter a lottery to go into Boston. I made Ryan sign up with me and while at the venue we recognised another half dozen of our friends in the crowd of about 90 Harvard affiliates. Those were some fantastic sticky buns they made! Here we are with the stars of the episode. 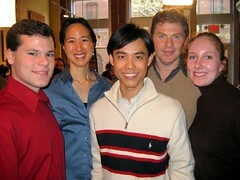 From left: Ryan, Joanne Chang (of Flour Bakery and Cafe), me, Bobby Flay (one of America’s Iron Chefs! ), Tiffany. Here I am playing tourist (after four years of living here!) 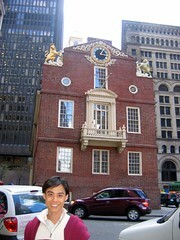 right outside the Old State House in downtown Boston, which I’d never seen before. We accidentally came across the building while walking from the filming to the Harvard Club of Boston at One Federal to Macy’s at Downtown Crossing; I’ve always loved the compact-ness of Boston. Ryan (who took this picture) tells me that is the very balcony from which the American Declaration of Independence was first proclaimed in 1776. I was struck by the incongruous discovery that part of the building now houses the State Street subway station (on the orange and green lines). Can you see why I don’t want to leave? Sigh. Tomorrow evening (Wednesday) I will be presenting my senior honors thesis as part of the series of informal “Senior thesis desserts” (implying the free Finale desserts which will be served). Quincy House SCR, 7pm in case you’re interested. Which also means I now need to go and re-read my thesis for the first time in weeks and prepare some slides and speaking notes. What an anxiety-inducing task. Never mind that the past month was a movie-magic slo-mo head-on semi-trailer-against-train wreck. I’m done. Numbered, bound, and turned in for judgement. Suddenly I can sit in the sun and chat with Christine as the envious, incomprehending freshmen and sophomores hurry by enroute to class. I’m that senior now, I recognize the type from years of being on the other side. The most arresting article I’ve read anywhere recently is this feature on Imelda Marcos from this month’s W magazine. Imelda was of course the first lady of the Philippines for quite a while (1965-1986) while her husband, Ferdinand, was President. Outside of the Philippines she’s famous mainly for her staggering shoe collection, the cost of which is probably some small fraction of the huge sums of money the Marcos’ are accused of embezzling from the national coffers (allegedly around five billion dollars). But the article is fascinating mainly for the richness of Imelda’s story, the people she knew (Saddam, Doris Duke and the Pope all make cameos) and the vividness of her personality. Much more interesting than anything that could be written about Anna Nicole. Go read and see for yourself. And today I learnt another new thing: the differences in form and usage between the em-dash, the en-dash, the hyphen and the minus sign. Who knew? Posted in General Posts, Harvard, Memories, Singapore, Thesis | Comments Off on Have you heard? I don’t recall the details exactly (I’m sure I could cite Booth 1996 if I really needed), but the symptoms of opium poisoning and/or the withdrawal symptoms for habituated opium users can include nausea, vomitting, gastrointenstinal pain, joint aches, dizziness and periods of unrestful unconsciousness. Oh, so that’s what it would feel like. It was oh-so-lovely to see Allicia again, who’s in town on break until tomorrow. And I do remember Lena quite well from somewhere unplaceable, probably Allicia’s room. I hope she sends me some of those pictures. Cafe Algiers = *heart*. Great food, wonderful beverages, excellent prices, convivial atmosphere (we sat on the terrace, bare arms and exposed necks celebrating the respite from winter). What’s not to love? It was great to feel like I was in a different time, place and community for a couple of hours, especially today. Getting to chat briefly with Rich on Allicia’s phone was also a treat. Shades of a time and place distantly remembered and still being written. I hope I manage to visit before April! The meeting was a new feat in plumbing, beyond what I had thought possible. I’m pretty sure I never even imagined anything like this before, say, last week. Now I could almost have precisely predicted the details. I think I’m almost done talking the whole experience dry. Maybe I’ll write about it someplace else. But for what purpose? Second-guessing is such a boundless excercise. Despite everything, it’s hard to work when it feels like the sky is falling, and your world might be falling along with it. What will I immediately miss most about leaving Harvard behind? I’m starting to think it’s going to be things like the seemingly unlimited academic resources (the supercharged Google-scholar-and-HOLLIS system, the free Naxos access, the turbo wireless and broadband web access, the expectation that professors and administrators are there for you), the ability to give admission tours (still sincerely selling the Harvard dream, after all these years), and the crazy perks (the espresso at HUCE, the OFA and UC grants, the free travel). I don’t know how I’m going to deal with having to move this blog (do I have to? ), change my email address and no longer depending on HUDS. At least what I might have expected to be the hardest parts of the process have been essentially preemptively done for me. So, according to research led by a visiting fellow here, big brains are better for birds. Very fluffy! Shopping week starts tomorrow, which means a new, and final, college semester for me. What a frightening thought. I’ve loved college far too much to want to be done, and at the same time I’ve barely even scratched the surface of what this school and city have to offer. Subject: [Quincy-open] shopping for courses? or a new concentration? Still looking for an elective? Or a new concentration? Or one of these new-fangled “secondary concentrations”? The Sociology department has a lot to offer; feel free to contact me or another Soc tutor with questions or stop by at the Course, Career and Advising night on Thursday! Sociology 10: Introduction To Sociology (Jay Gabler). At last, the answer to the age-old question: What the @#*! is sociology?!?! It happens to be a way to understand all sorts of social phenomena, from Puritan witch hunts to suburban angst to strip-dancing. All this and more (except the last part, unless you tip the teaching staff generously) in WJH 1, Mondays and Wednesdays from 11-12. Sociology 19: Reinventing Boston (Chris Winship). Boston was once thought to be doomed to a future of blight and decay. How did Boston escape New Haven’s fate? And can we blame Yale? The answer to the second question is obviously yes. The answer to the first question can be found on Tuesdays and Thursdays from 1:00 to 2:30 in WJH 105. Sociology 24: Introduction to Social Inequality (Jason Beckfield). Bound to be fascinating, even for Quad residents who feel that no introduction is necessary. Takes a comparative perspective, so you can finally find out why sociologists keep moving to Sweden. Tuesdays and Thursdays from 11:30 to 1:00 in scenic Sever 214. Sociology 67: Visualizing Social Problems in Documentary Film and Photography (Tamara Kay). If you were moved and outraged by Aunt Mitzi’s video of Thanksgiving dinner, just wait until you see the social problems WE have to show you! From war and poverty to environmental degradation, all the stars are out on Wednesdays from 1-3 PM in WJH 105. Sociology 107: The American Family (Martin Whyte). The American family is often thought to be changing in ways unfortunate for children and society–but if you think families in the 50s used to sit around the dinner table and sing Kumbaya, you’ve got another think coming. That think will be arriving in WJH 4, Mondays and Wednesdays at 1 PM. Sociology 153: Media and the American Mind (Jason Kaufman). 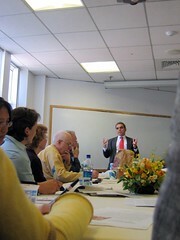 Cassandra Wibben-Meyer took this course in spring 2004, and Prof. Kaufman is STILL quoted in her Facebook profile. What else do you need to know? Mondays and Wednesdays at 10 AM in WJH 105.
and Thursdays from 10-11 AM, CGIS S-010. – It’s a little shocking that this season Hermes showed all of one bag out of over 40 looks. – The menswear designer for the house of Lanvin seems to have fixated on a particular shade of violet last seen on Stefano Pilati’s Spring 2007 womenswear runway for Yves Saint Laurent (literally planted with hundreds of violets). – For grooming, Gaultier showed the most amazing hair, inspired by the 1975 film Shampoo. – Louis Vuitton, one big yawn. – John Galliano presented a completely over-the-top menswear show featuring models dressed as post-apocalyptic-road-warrior-samurai-tribesmen, giant metal headdresses and all — but at least there were actual, somewhat wearable clothes shown. At its best moments it reminded me of the most desireable clothes in The Hitchhiker’s Guide to the Galaxy, while the low points recalled the worst wardrobe of Waterworld and Planet of the Apes. Actually, John Galliano is having an especially strong year as a designer/artist. His sculptural creations for Christian Dior–inspired by origami and Madame Butterfly–which showed last week at the Paris haute couture FW07/08 shows were simply breathtaking. I was especially inspired by the towering combination clog-wedges and the clog-stillettos. Amazing. Nope, this is not another movie review. Instead, I’m currently in Harvard’s Geological Museum building (part of the Harvard Museum of Natural History and Peabody Museum of Archaelogy and Ethnology complex). I’m here after hours, as I sometimes like to be, working at the Harvard University Center for the Environment (HUCE). That’s where my concentration offices are based, so it’s my academic “home” on campus. Taking the efficient, friendly staff as a given, I really like HUCE – it’s a posh, comfortable new space with all the amenities a student looking for a workspace could hope for, including an almost-always-empty computer lab which outranks most of the computer labs I’ve ever used with it’s pitch-perfect mix of aesthetics and functionality. I really should bring my camera with me sometime – I especially like the view of the chemistry labs in the next-door buildings from the meeting room at the Center – very graphic and colorful, plus it’s fun to watch all the grad students in there running experiments late into the night. I’m sure my grad-student friends will relate to this, minus the “fun” part, perhaps. So I’m here working on my senior thesis, which is becoming increasingly and delinquently behind schedule. This Intercession period between semesters is really one of the final opportunities to devote substantial, uninterrupted time to the project. Hopefully I’ll make enough progress to ensure that firstly, I don’t become one of the 1-in-6 students who never completes their attempted thesis, and secondly, that I have a good shot for honors. Although to be honest, graduating with honors somehow no longer seems to matter much to me, despite the fact that I am still hoping for, and working hard towards Latin honors. In truth, while I’ve always somewhat wished that I could be better motivated by extrinsic honors and motivations, somehow the goal of showing a perfect score or having nice things to put on a resume never seemed sufficient to drive me enough to actually memorize multiplication tables, or to give up extracurriculars in order to concentrate on inorganic chemistry. At least that’s what I’m saying now – this could all just be cognitive dissonance trying to rationalize away the foolish recklessness and laziness of years past. Nonetheless, as I’ve reasoned before, in the end I’ve had pretty much everything I’ve ever truly wanted, in essence if not in its originally conceived form. I’m very much thankful for God’s grace in all that, of course. But focusing on what that potentially means about my internal, probably subconscious, mental calculus, perhaps the key thing is to figure out what I really want and why. It’s probably true that I already tend to perform far too much meta-analysis – what is experience worth; what does this choice mean; how does this development fit into the bigger picture? These questions can be tiring to ponder, especially when few people want to listen to you explore them – of course they have better things to do, and analysis takes time, time which could be spent, easily and profitably (ostensibly) on other scheduled tasks and amusements. Never mind that, for me, much of such analysis leads to a “everything-is-meaningless” or “everything-is-equally-meaningful” (potentially) conclusion that is mainly distinguished from existentialism or nihilism by cheerful optimism and, more importantly, faith in God’s benevolent, omnipotent and active existence. Coming back to the thesis-writing, this aforementioned general inability to ignore the possible larger implications is hampering my ability to write, among other issues. As I was telling Lorraine today, it’s difficult to think of this as “three longer final papers” or some other more manageable and less intimidating framework. I can’t avoid the sense that what I’m writing about is important, and the end product should actually represent the best possible analysis and recommendations I can produce. It’s easier to be flippant about opinion pieces on ancient history or literary analysis, or even term papers on morality and public policy; in those cases it almost doesn’t matter what you think since the effect on the world will be close to nil, one way or another. But that’s not the case when it’s a piece of work that has a chance (albeit small) of being taken seriously and affecting the world, and shaping your future research and career (considerably larger chance), and will ultimately be a sort of calling card for your beliefs and analytical abilities. Throw in the predictive component of what I think I will write (and everyone knows the pitfalls of trying to soothsay the future), and maybe my apprehension will appear less immediately irrational. On a happier note, I think I made some good progress today, although I didn’t write anything substantial. And now I shall go read some more. Earlier when I went to the bathroom, which is just past the slick “climate change” exhibit , the motion sensor lights didn’t detect me, so I proceeded in near-darkness. You can see how familiar I am with this space. Anyhow, I was especially impressed that both the motion-sensor flush and the motion sensor taps came on, even in the dark, with no special effort on my part. How’d they do that?? Anyone who understands the technology, feel free to enlighten me. The problem with having short hair, which I’d completely forgotten about, is that after a mere four weeks it looks straggly and ready for some professional maintenance. I refuse. No thank you. I told myself I’d wait till after June. Ok, maybe I’ll see about fixing it for graduation. Maybe. What can I say? It’s fun to *finally* be able to wear my new long coat, courtesy of Mr Pinky, whose exceptional tailoring services are now available internationally online at www.tailorclothes.com. Especially since it’s been nearly 7 months since I bought that cloth at my favorite fabric store in London and then proceeded to lug it through another 20 or so cities over the next two months on World Tour.